Jimmy Wales is in San Francisco at this very moment, talking up Wikipedia. I've already had my say about Wikipedia back before I started blogging, so I won't belabor my points about encyclopedias in general and Wikipedia specifically or start in on anecdotes about childhood homework disasters and Elizabethan Crumsters made of cardboard and dried spaghetti. Surely there's a statute of limitations on such traumas. That said, there must instead be something I can do in celebration of Jimmy Wales's visit to our fair city, made of Jello and replete with steep hills and staggering vistas. Ah, I know. My friend Lelia told me a story about an unnamed prankster in upstate New York who added a teeny-tiny bit of fraudulent data to Wikipedia almost a year ago. I'll go see if it's still there. That'll be my celebration of Mr. Wales's visit. It's like that Deviled Ham Spread recipe on page 666 of the Betty Crocker cookbook: it's not that hard to sneak something into a voluminous reference work. And someone was no doubt quite pleased about the Deviled Ham Spread caper. I don't mean to digress, but I need to explain this Betty Crocker reference. I have an old paperback Betty Crocker Cookbook, printed November, 1974 by Bantam Books. 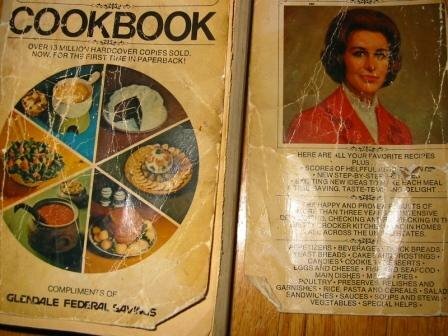 It's from that era when savings and loans gave you cookbooks when you opened an account; this one's compliments of Glendale Federal Savings. Both my grandmothers opened multiple savings and loan accounts around then, I suspect just to get the cookbooks. Then they gave them to me; I have quite a number of them. I don't think they were hinting around about my cooking skills, or how cooking skills were necessary to land a husband. They both worked and knew that supporting oneself was the skill that mattered. Nonetheless, they thought I might want a cookbook or two to stave off starvation there at Caltech. This one's from Grandma Goldie and I've had it so long that the cover's falling off. She gave it to me in January, 1975, when it was hot off the presses. I can't help but wonder whether the deviled ham reference made it onto p. 666 in subsequent editions (perhaps offered by Home Savings and Loan). It's more than a coincidence. Deviled Ham Spread is in a section devoted to recipes for party sandwiches, a more important phenomenon back then, when Rumaki (p. 15) was falling out of favor and sushi hadn't quite made it to Midwestern buffet tables. (If it had, it would've been in the index, falling squarely between Surprise muffins and Swedish meatballs.) What kind of party sandwich spreads are accounted for? We've got, in order of appearance, Avocado Spread, Cottage Cheese Spread, Creamy Cheese Spread, Golden Cheese Spread, Ham Salad Filling, Olive-Nut Spread, Shrimp Salad Filling, and Deviled Ham Spread. Deviled Ham Spread is all by itself on p. 666. That in itself could've been an unusual, but not inexplicable coincidence. But notice Deviled Ham Spread is at the end of the list. It's out of alphabetical order. It's a crop circle in the plowed fields of party sandwich spread recipes. It's the work of some mischief-maker. And so it is with the Wikipedia factoid I'm looking up. Only I can't quite remember what it is. It's in the demographic information about a town in upstate New York. It was a figure for the average IQ of members of this town. That's all I can recall of the anecdote. That and I checked it for veracity 4 months ago -- much to my surprise, it was there. But that was then, this is now, and Jimmy Wales is talking at Long Now. Isn't this what Google is for? I type in "New York" demographics "average IQ" and because Jimmy Wales is in town tonight, I'm feeling lucky. Very lucky. Sure enough the page that comes up is the Wikipedia entry for Pittstown, New York. And there it is, "The average IQ is 68." 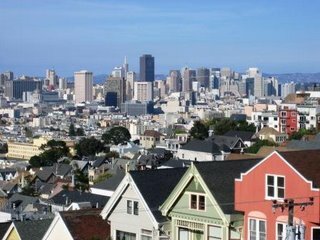 Welcome to San Francisco, city of Jello. Look! I've attracted my very first blog spam. In the future, I'll write more about how much I love spam -- too much to delete it. It's how we'll know anything about 2006, by the spam that survives. So thank you, Mr. or Ms. Askinstoo. I'm certain you did make over *$900* having nothing but fun. I'll have to pass on the link though. I never order those Sea Monkeys either.